In a moment’s time, the burning tangerine sun rises above the horizon, sits below the pink clouds shuffling south, then disappears. Playing peek-a-boo; its rays streaming through the silhouetted oak tree with vibrating leaves. Through our window decorated with Harvey’s fingerprints. 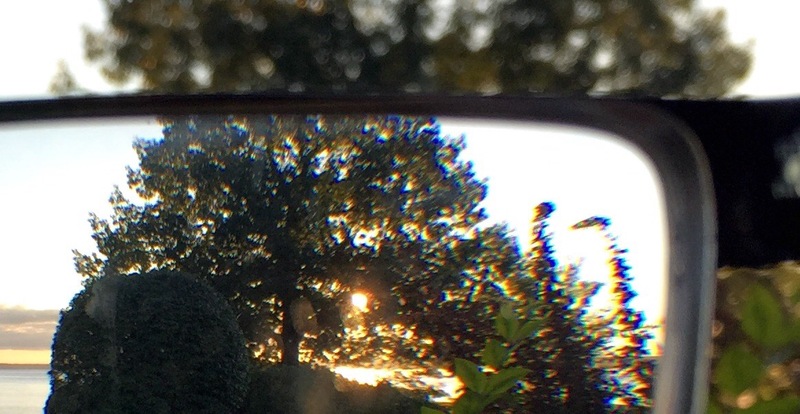 Through the scratched lenses of my glasses. And on to me. Painting me in the warmth of morning. Compelling me to smile and be grateful for the view. And for the people I share it with. This entry was posted in 20 Minutes, Chris' Writing, Home Ownership, Our Experiences on 13 September, 2015 by Chris. Thanks to some professional help, we’ve moved the blog to my old domain, yugflog.com. We no longer live at The Double Dogleg, so the move was appropriate. Below is the old sidebar text that I removed, which I’m saving just because. Our “driveway” is the implied noun that is described by “double” and dogleg,” as it does have two doglegs that must be navigated upon leaving and returning. This entry was posted in Home Ownership, Our Experiences on 8 September, 2015 by Chris. Closed on The Double Dogleg and the New Home! We closed on the sale of The Double Dogleg today, and also on the purchase of the yet-to-be-named new house (actually not so new, but new to us). We had been watching the new house since early or mid-spring, but didn’t fully realize the vision. We agreed that if the new house was still on the market when we returned from Walt Disney World in mid-April, we would list The Double Dogleg and put an offer in on the new house. Our offer was competitive, and we were lucky to find a buyer for our house in relatively short order. Once the respective purchase agreements were signed, we set our eyes on a late-June closing date. This was eventually delayed by about a month, and we finally closed on both houses at 10am on July 15, 2015. Throughout the sale process and the packing (mostly by Lindsey), Lindsey was pregnant and Carson was born on June 8, 2015. So, while we’ve been living out of various boxes strewn throughout The Double Dogleg, we’ve had a crib in the living room and spent most nights taking turns sleeping on the couch. I’ll remember that there is stuff everywhere. Diapers in the dining room. Kitchen stuff in the Yogi room. A basement full of my stuff (just. can’t. let. go.). I will also remember, and miss, The Double Dogleg’s solitude, wooded views, epic snow blowing opportunities, back porch bon fires, goldfish in the pond, raking (and raking more), the many improvements and clearing we did, the various tenants, sledding and skiing in the woods, Harvey growing up his first two years there, Lindsey’s car slip on Christmas Eve 2011, killing dad’s snow blower, relentlessly clearing saplings, maple syruping, Mt. Yogi and our other signs, shoveling everything everywhere, the sliver of beach and the stuff growing on it, jumping off the raft, hiking in the woods, looking up at the canopy, and many other memories and adventures that have been previously documented here. The Double Dogleg was our first house together and the house to which we brought both Harvey and Carson home. And those memories, along with the many others, will stay close to our hearts. And now it’s time to being the new adventure of making the new house our home sweet home. This entry was posted in Home Ownership, Our Experiences on 15 July, 2015 by Chris. We clean out the basement form time to time, trying to keep the “stuff” from piling too high! I’m notorious for holding on to things . . . especially, all of my collections of everything from childhood. I enjoy the re-discovery upon returning to the items, but sometimes it’s apparent that things have to go. Plus, we have to make room for Harvey and his little brother’s collections! The following quote is a good approach to dealing with the less important possessions that pile up . . . like extra jackets, clothing, kitchen appliances, old sports equipment, parts of lost tools, etc. This entry was posted in Home Ownership, Our Experiences, Quote on 20 March, 2015 by Chris. Lindsey and Harvey bought maple syruping supplies at McGough’s in Traverse City. After reading a few articles and watching a YouTube video, we went out and started drilling holes in trees. 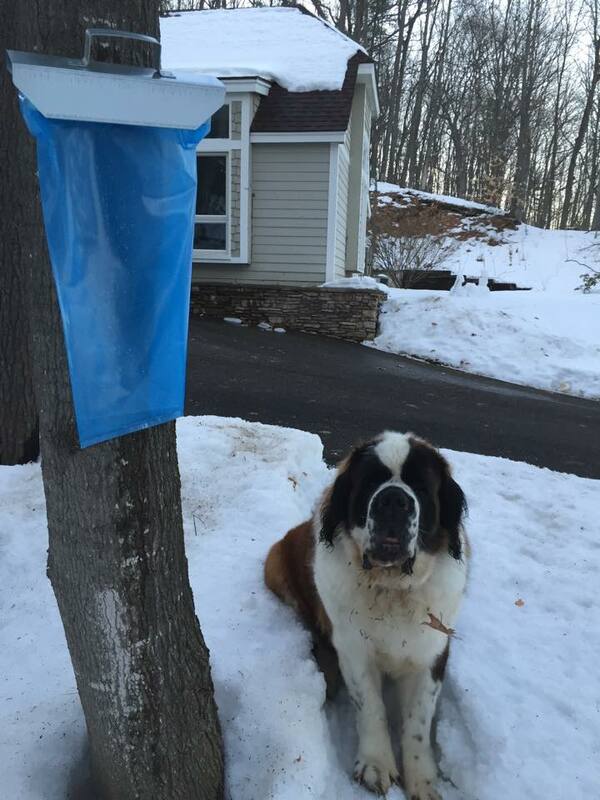 We found two with running sap, placed our spiles and hung our bags. Now we wait and see what we get. The next adventure will be boiling it down. 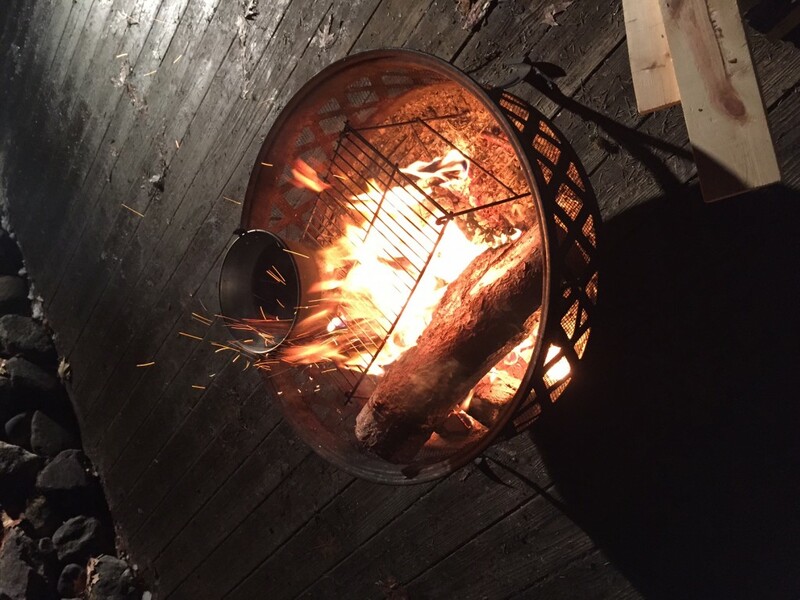 We bought an old metal pot from Walt & Susan’s Antiques on Old Mission Peninsula, and then built a roaring fire in the metal pit on our back deck. This all began about 5:30pm. 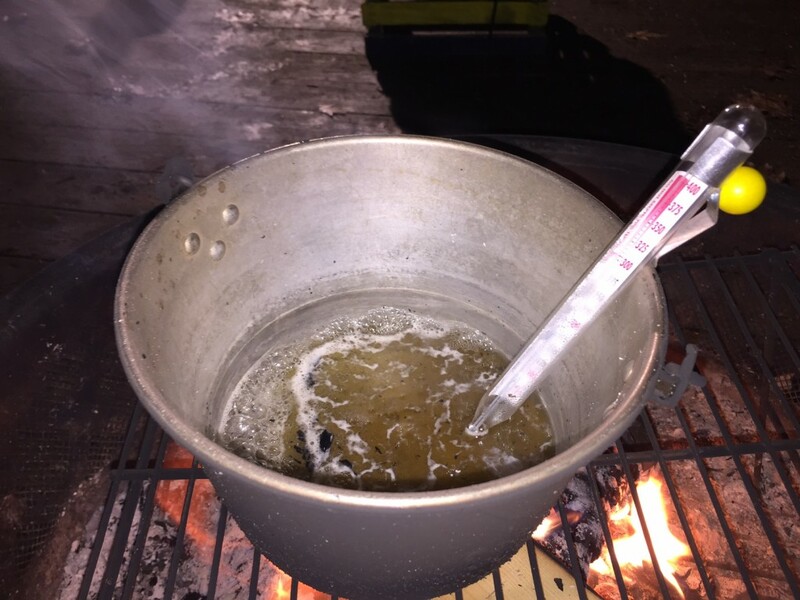 Reducing the 1.5 gallons of sap to about a 1/3 cup of syrup took almost six hours. I finished up around 11pm by filtering the embers out of the syrup via a coffee filter. It was satisfying to end up with what we set out for. Here are some pictures. This entry was posted in Home Ownership, Our Experiences on 11 March, 2015 by Chris. I built this bench from two stumps left by the road by the power company, six nails from my Grandpa Rogers’ workshop, and an extra board we had in the garage. 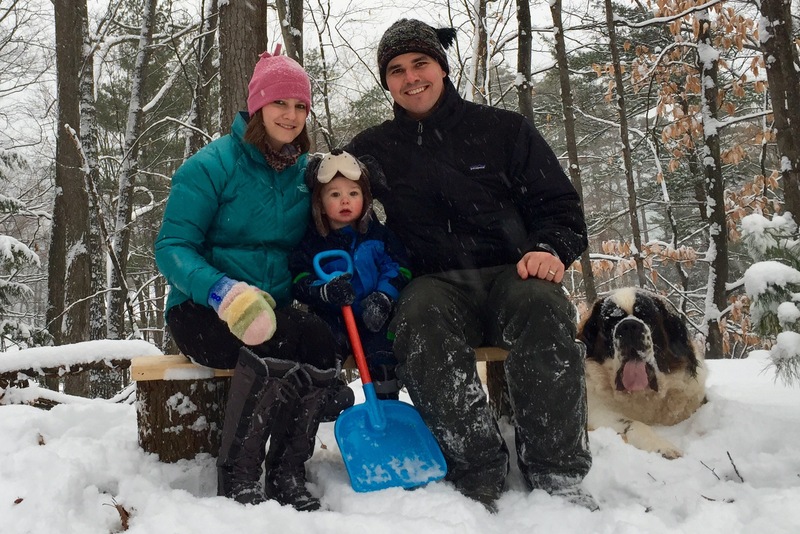 It’s just big enough to fit the whole family on the first really snowy day of the winter. 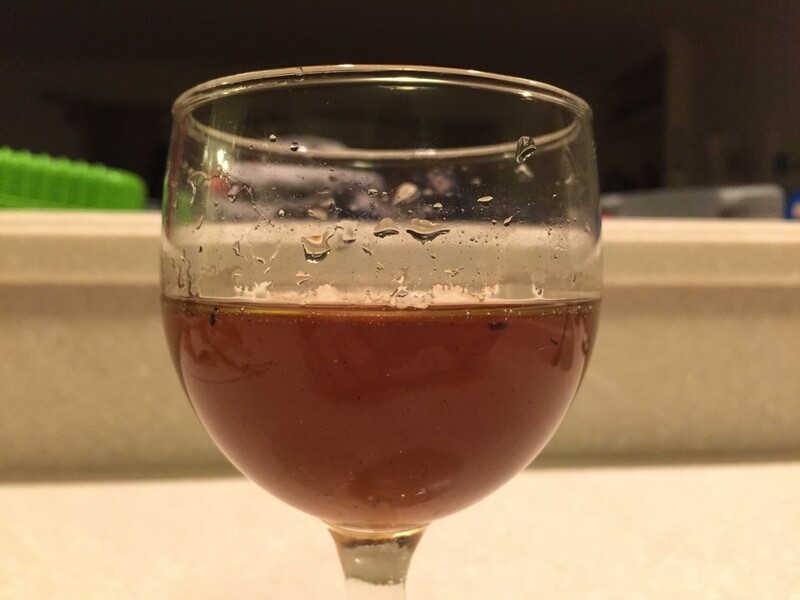 This entry was posted in Home Ownership, Our Experiences on 4 January, 2015 by Chris. 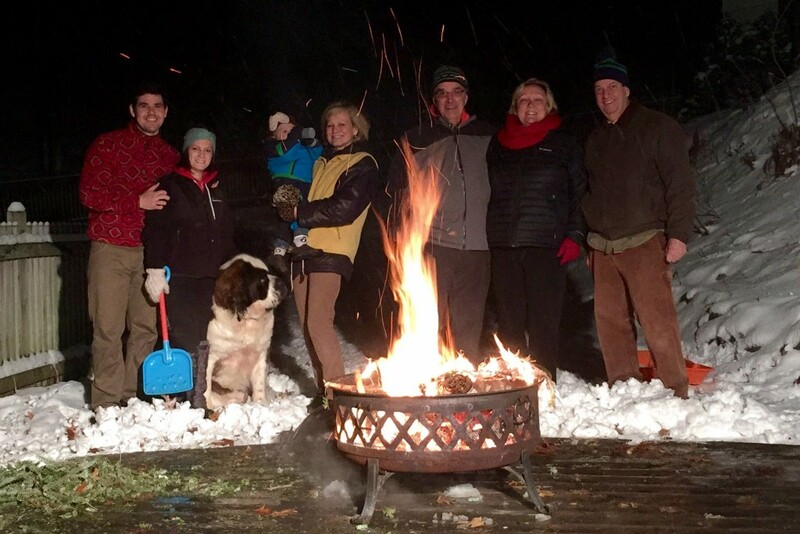 We took down the tree today and used it for a bonfire. All of Harvey’s grandparents came over for a s’more and to play LINKEE – but really just to see Harvey, who taught us all how to shoot hoops. 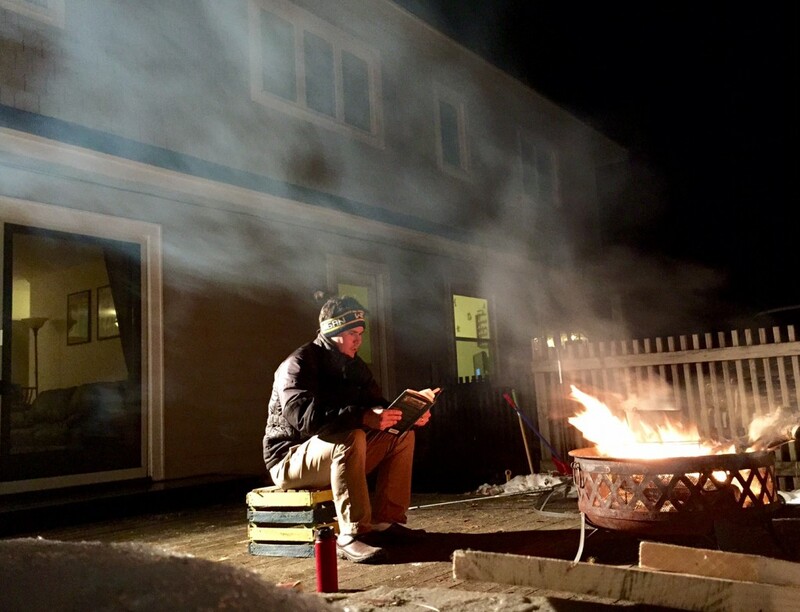 This entry was posted in Home Ownership, Our Experiences on 3 January, 2015 by Chris. This morning, I shoveled for the first time this winter season. An inch of snow covered the leaves on the driveway, with a skiff elsewhere. My shovel broke halfway through. That’s the third yard tool I’ve gone through this fall, after breaking the handles of two rakes last month. This entry was posted in Home Ownership, Our Experiences on 12 November, 2014 by Chris. 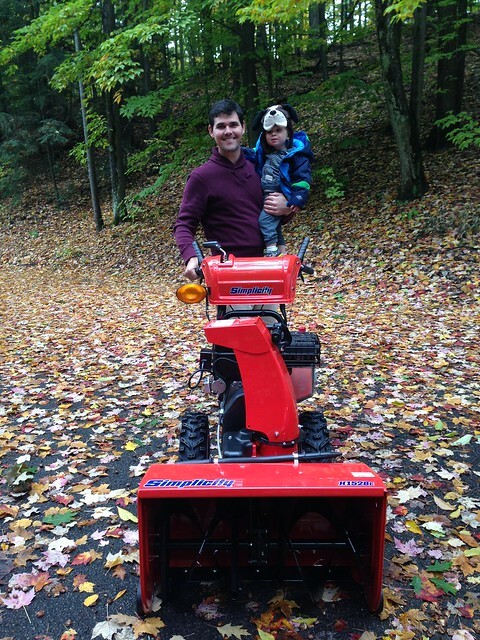 Here I am – the proud new owner of a Simplicity 28 inch snowblower. It has heated handles, a built in light, electronic spout adjustments, and so so so much more! I will miss the Ariens snowblower. It didn’t deserve to kick the bucket so soon, but I learned a lesson – check for oil at least once a year! Grandpa R, anytime you need a snowblower, let me know! I owe you one. This entry was posted in Home Ownership, Our Experiences on 11 October, 2014 by Chris.